Approx run time: 36 minutes. This is PART 2 of a two parter on sustainability, climate change and consumption. Listen to part 1 here. Arshiya Bose (AUB): It’s not a collapsing fisheries, or really the rapid extinction of a species coffee absolutely… so coffee is a plant that its production from a conservation perspective is not all gloom and doom. Coffee absolutely has so much scope for looking at how you might create an absolutely-out-there-far-out-model of cultivation that is far more in tune with the local ecosystem. The kind of environment it is in, but also the participation of small farmers in growing really, really high quality speciality coffee. Radhika Viswanathan (RV): Arshiya Bose is a scientist who completed her PhD on environment and development in the 2000s. Her PhD research focused on market approaches to biodiversity conservation in India - or how markets can be used to create a sustainability value for products. To get more specific, she studied how this could work for small scale coffee producers in Coorg, a district nestled in the Western Ghats of south India. In this episode we’re going find out about our relationship to the things we love - Like fish, coffee, travelling. These are things that are frequently talked about in relation to high consumption lifestyles, the kind that make climate change worse. We all know that sustainable producers needs ethical consumers. Going beyond the label, how are organisations in the sector contending with issues such as livelihoods of small scale producers, value chains and their inclusion in global markets, environmental and biodiversity sustainability, and most importantly the changing power structures needed in the marriage between producers and consumers. Basically, what does it take to make the marriage work? 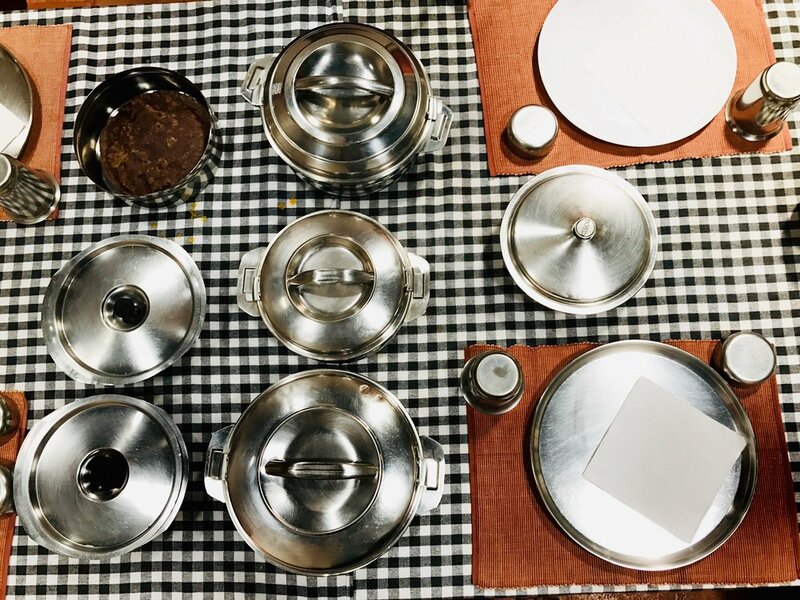 Samyuktha Varma (SV): This is the second half of a two part mini-series on the relationship between sustainability and consumption in India. If you haven’t listened to part one, please do so now, everything in this episode will make better sense if you do. Welcome back to In the Field. In the Field is hosted by Radhika Viswanathan and Samyuktha Varma, and we are supported by Rohini Nilekani Philanthropies. SV: Until around 200 years ago, most of the Western Ghats were forests. But major ecological changes took place at the time, when vast tracts of forest land were cleared to make way for the famous tea, coffee, spice and rubber estates that we’ve come to associate with the region. AUB: Originally what you do – wild coffee grows under the shade of native tree species and so a lot of the early history is not clear felling of forests but interplanting of coffee with trees which is a fascinating history it’s not exactly the case elsewhere in the world, south and central America for example where the largest volume of coffee is produced, people clearfelled the forests and climatically those regions are different, they get rainfall every day so the shade trees don’t play an ecological function during hot drought or summer. This is a cause for concern because the hills are really not that high! AUB: The kind of weird quirk of the coffee plant is as much as it requires shade it also requires sun so the productivity of coffee is very high when it grows under direct sun so this balance of do I keep shade so I’m protecting my coffee during the summer? or do I maximise the fruit set per plant ? Is a decision that producers deal with or gamble with every year and over the past thirty years in the larger coffee growing districts - take Coorg for example, there’s lots of ecological data that shows that almost 33 -35% of the trees have been lost from these districts because of the removal of shade trees from coffee farms. RV: Agroforestry has intensified overall, not just from coffee, and there has been a direct impact on the local biodiversity of this region. AUB: Over the years, decades, the increasing use of pesticides, fertilisers, weedicides, fungicides that then are not only of course killing off unwanted weeds and so on but are also impacting biodiversity. So we’ve seen large scale impact on bees across coffee growing areas, a lot of places that were equally famous for honey as for coffee like Coorg, you find very little honey production because pesticides have completely wiped out bee populations. RV: When you’re grappling with the question of sustainable or ethical production models, its difficult when the system you’re working with has a legacy you cannot change. Coffee has been produced in Coorg for 200 years, the plant itself comes from Ethiopia. Many of the small producers who now grow coffee used to grow vegetables on their land. Since her PhD Arshiya has founded a small coffee company, Black Baza Coffee, that works directly with many of the communities she was researching earlier. AUB: …And yet now it has become the predominant source of livelihood for lots of people across the world. So should it be? There are two questions there. A is recognising the fact that it used to be forest and B it is recognising the fact that a lot of people who grow coffee used to grow tubers, they used to grow food and now they no longer do. They are dependent entirely on this commercial cash crop. Which is massively problematic right. So actually one of the conversations were having with some of the growers is that can you revert back to setting a small part of your farm for something else that you were growing. Which is crazy for a coffee company? Why would we do that? Why would we look at taking areas out of coffee production? AUB: There was no appreciation for any PHDing with the coffee producers I worked with, and and its interesting because these questions that ‘can a business engage in conservation and development’ is something that only conservationists and development people have asked us! None of the producers we’ve worked with have ever found this to be a conundrum. SV: The idea of markets for nature, that communities can be offered tangible monetary incentives in order to change the way that they may use or conserve land is an important approach in environment and development that has taken off in the past twenty years. When Arshiya began looking to study market based approaches in India, she didn’t go very far. AUB: But I sort of almost hit a wall because there weren’t that many market based projects at all. RV: And that’s how she wound up studying ecological certification mechanisms in coffee, which is another way to create a market value for sustainably grown products and off late certification has mushroomed in India. AUB: And the logic of a certification and the label is very simply that if I’m able to give you a premium per kg per kilo for the produce you have then will you qualify or meet my standards of farming. Of course we find that these global certifications models have limited local relevance. A lot and almost all of these certification models are almost universal blueprints that are intended to be followed in exactly the same way across the world. RV: So for example, she tells us that global coffee certification may mandate that farms have a minimum number of shade trees. AUB: Might be super relevant in a country like Brazil where coffee farms are clear felled, and might have absolutely no relevance in India because most coffee farms have by nature 12 trees per ha. RV: It doesn’t mean there aren’t any ecological concerns in coffee production in India , it means that India has a different history, different conditions, and producers react differently to these factors. A blanket approach doesn’t work here. SV: There are also problems in the way in which the impact of these certification models are often measured. For many companies, certification is a medium of achieving scale, which is often measured not by an ecological or social metric, but by the quantity or volume of the certified product that is sold. And this may not match the diverse local contexts under which sustainability ought to be achieved. AUB: Right. So you know one of the kind of key conceptual limitations of a global certification is the fact that’s its global and not designed for keeping local contexts in mind. So for example this ecological issue is there. But the other issue we kept finding was of course certification talks about minimum wages being paid to workers and assume you have a large plantation, tea rubber, coffee whatever, minimum wages being paid to people working there which is not a question of living wages at all, and those are completely different issues. RV: The issues of certification also come up in other areas. In our last episode we talked about the challenges of sustainable fish production to Dr. John Kurien, who has worked with small scale fisherworkers for many many years. And here he is pointing out the vested interests of large-scale producers who influence certifications. For example, the Marine Stewardship council was set up nearly 20 years ago by Unilever and the WWF. John Kurien (JK): Two big multinationals, one multinational in food and other products and one multinational in terms of trying to organise our environmental consciousness….they said that what they will do is, they will certify fish. And once this fish is certified by them then you can get a logo, and then when the consumer buys it he can be rest assured that the fish that has the marine stewardship logo, has been caught in a sustainable manner. SV: How do you certify prawns that have been caught through trawling in tropical seas? JK: It just doesn’t work. You see, if I try to certify that the prawns which are caught in the trawl are you know caught sustainably there is no way to track to see what has happened to the rest of the ecosystem. SV: Arshiya also tells us that there’s a lot of market research done that looks at whether consumers prefer to purchase labelled or certified goods. AUB: And I think counterintuitive to what me might think is that people don’t… but in general consumers are not super inspired by certification labels and yet they are the only go to mechanism that there is to look at large scale I would say sort of almost lower common denominator for standards for products, tourism and other things. SV: To what extent has certification worked on you? I will admit that it works really well on me and I’m a huge sucker for anything labeled sustainable. But what I worry about, and this is something I actually read once in an academic paper, is that consumers who regularly buy certified goods just end up actually consuming more. Which makes sense, we probably have a larger expendable budget. If consumption itself is the issue, for there to be any hope in the world we all need to consume less, don’t we? RV: If products entice more consumerism, then there’s no product bigger than tourism because tourism packages EVERYTHING about a place. And what better example than the state of Kerala, that has for years been known as God’s Own Country because of a clever marketing strategy by the state early on. Tourism is an explicit and large part of the state’s development strategy, as it is in other countries like Sri Lanka, Thailand or even the Maldives. RV: Sumesh Mangalassery runs an NGO and a tourism company called Kabani in Wayanad, in the delicate fragile hilly ecosystem in north Kerala. He says his approach to tourism is different and tries not to use a consumerist paradigm to attract tourists. But it’s also a home to a large number of eco-tourism hotels, homestays and experiences. Sumesh Mangalassery (SM): I hate that word… you know what is ecotourism. Basically people wanted conservation, people wanted tourism through conservation – I mean conservation through tourism, that's how the terminology, the concept and all came. But what is happening today? In the name of ecotourism, people are bringing tourists to ecologically sensitive areas. That's not ecotourism. SV: Sumesh says to think of it as a triangle. There’s the traveller, of course, and local communities, and then there are the tourism service providers - the guides, the taxis, the hotels, the homestays. And each group is trying to extract the maximum benefit for themselves. SM: For example, a traveller is always looking for some sort of exploiting the service providers, so how to get benefit out of you know whatever, and the service providers is also looking for how to kind of get maximum benefit out of the traveller…and the local communities always get the bad part of this both people like you know pollution. So this is the normal situation but in an ideal situation all these three people have got one interest, that is good travel. RV: Wayanad comprises of largely agrarian communities who have been facing the impacts of variable climate for years. Sumesh says the communities are experiencing agrarian distress. Operating in Kerala within a context where tourism is the development model, Sumesh is trying to tweak the system such that it enables the community to have more power in determining how they want their environment to be experienced. And his organisation has been working with communities to help offset the interim losses that occur in the transition to organic farming. SM: We are trying to bring tourism to agriculture, both are different, bringing agriculture to tourism is basically a tourism product, but here we are trying to do another approach, basically bringing tourism to agriculture, so they all continue their farming so basically we are trying to fill this gap. Like one is of course it is not a consumer driven program. We don't worry about our travellers. All the farmers and others involved in our program taking tourism as an additional income, no pressure at all. And secondly, as a host community, they will decide who should come and who will not come, it is very clear for us. SV: There is a different kind of accountability needed at the level of the state if in fact tourism is going to be part of the development model, and the policies need ensure that communities also receive a portion of the benefit. Especially if we’re working towards achieving our SDG goals - which also include tourism we need to develop tools that look at tourism from a development lens far more explicitly. There is no way to suggest that tourism is not detrimental in some way. Many places around the world that receive huge numbers of tourists have raised issues, from Barcelona, from Mount Everest to the great barrier reef, and even Sikkim. SM: So we don't want to call our organisation as a sustainable tourism model. We [use it] sometimes, but it's not right I think. Politically it's not correct I would say. RV: The footfall and consumption of hoards of travellers, no matter how large or small their footprint has a cumulative impact on everything from fuel, to food, to waste, and even the people and their culture. SM: but at the same time what we are trying to do, we are probably one or two tour operators in the world, we tell our customers that you know especially long haul travel, if you really require you come, but if you come for that, please use as much as possible, public transport as much as possible, and spend your vacation in the villages, at least people should get some benefit, because we are talking about climate justice because it's a justice issue now. SV: One of the really interesting angles we explored when researching this episode was the approach that each person we spoke to took to set up their operations with the communities they work with. And even over the past ten years, a lot of the classic development ‘philosophies’ has given way to new ways of doing development - see how the social enterprise model have proliferated. But more importantly, we wanted to explore this because how you run your operation is also a reflection of your underlying ethics and your theory of change. I think fundamentally at a level it challenges the fact that why do we assume that businesses always want to exploit natural resources and people, I think there’s no longer the need to assume this particularly because so many of the farmers we worked with wanted this kind of model, they didn’t want to set up an NGO. They didn’t want to set up a trust they didn’t want to set up an environmental awareness campaign. They said look we’ve been growing coffee to sell it for the past 100 years, that’s the major need that we have had for the past 100 years so can we work around coffee? RV: In the end the vehicles of development - the organisations the NGOs, the businesses, would ideally like to improve the bargaining power of the communities, so that they are more in charge of how they sell and present their products. AUB: It’s our responsibility in a sense to communicate that nuanced story keeping well in place that our producers are extremely proud of who they are, their way of life and what they grow. And so this playing back and forth with the symbolic value of stuff is interesting and there/s a lot of critique of this poverty from a distance or action from a distance approach that often is taken to in the marketplace. Which is really something we really really stay away from. Thomas Zacharias (TZ): We are looking at sustainable seafood for example. If you were to explain that to like a five year old and say okay, you know at some point we're going to deplete all our resources of seafood in the oceans, then the five year old will probably say okay, let's stop eating seafood. RV: Are we at the stage now where all of this is a no brainer? Is it time to start giving up these things. We know climate change is upon us and things will only exponentially get worse if continue as we do today. SV: We’re seeing a lot being done to educate people about sustainability, especially online, and through social media. Divya Karnad, the scientist from our earlier episode started something In Season Fish along with her colleague Chaitanya Krishna. They disseminate information online and offline to engage directly with consumers about what’s in season to eat and to help them make better choices about eating fish. There’s been a disproportionate amount of emphasis on making producers change their practices and Divya felt there needed to be more emphasis on the other group in the equation - the consumers - who are equally if not more responsible and powerful. RV: Thomas Zacharias is a Mumbai based chef, co-founder of the wonderful and extremely hip Bombay Canteen. It’s hip partly because it’s trying to make local Indian cuisines hip, by re-imagining them. He’s also prolific on social media, and created a hashtag, called the Indian food movement. TZ: I'm glad you mentioned Indian food movement. It's a random hashtag I coined about a year ago. So the reason I started the hashtag was to get people excited about, chefs and consumers, just people at home. And it came to a point where I realised that I was actually influencing them. When we talk about the Indian food movement its all of that put together. So I'm trying to get people excited about local ingredients, the idea that you can get great produce in our country as long as you just look for it and ask those right questions. That you eat seasonally; that there are vegetables meant to be eaten at a particular time of the year and that's when it's going to be at its pristine best. RV: But even today, there’s a clear distinction between a so called no holds barred social media movement online where chefs can play, and experiment and influence, and the food business, which is hugely competitive and is driven by profit. Food habits are admittedly dictated by trade organisations and chefs, but moving away from the norm takes longer than one would expect. Because consumers get set in their ways and expectations. But can they be moved? And what are they moved by? TZ: The thing is like a lot of what I talk about on Instagram we don't really talk about at the restaurant. We took a conscious call not to do that because ultimately we wanted this to be a fun place where people just come and just let loose. Somewhere along the way over the years, it's great to see that the two worlds meet and people either eat it here and talk about it, or see it on my Instagram profile and come and try it. I don't know how much of an impact that's having. I guess in subtle ways you can call it consumer engineering, but I think like I said it's not the change that needs to happen cannot happen from one chef one restaurant alone. And the problem is there aren’t enough people talking about it who have the voice or who have the influence talking or doing something about it. RV: There is a slow but sure move towards eating local today - but its definitely driven from an elite perch. But it’s still important because its moving consumers at this level who drive the demand for non-native foods. TZ: But what is happening right now it's more of a trend than anything else. Nobody is doing it for the sake and the real reason why we should be doing it which is to promote and sustain those communities, those people. SV: And so it also means going back and changing the mindsets of the chefs from the beginning. Which means catching them in school, and not when they’re running a restaurant worrying about profit margins. But hospitality and culinary schools in India are still quite fixed, and teach limited cuisines - and quite often “local” and “seasonal” aren’t words commonly used in class. TZ: And it's still like that. That is still how our schools are run. Talking about schools, if you go back to pre-college, talking about high schools, there's no conversation around eating, whether it's sustainable for yourself, or the environment or for the community around you. So there is a systematic problem which needs to be addressed. RV: And what Chefs like Thomas Zacharias want are discerning customers. Not discerning in the sense that they know their molecular gastronomy from their sous vide, but discerning enough to want to know where the food came from, and who all helped get it to the plate. And using that knowledge to perhaps make a change in their lifestyle. Here’s Ganesh, the fisherman, from our earlier episode. He wants the local consumption of local fish to increase, for sustainability, but also for the survival of his community, that catches the fish. SV: Basa became really popular a few years ago. It’s a tasteless - and therefore versatile fish that is imported and restaurants very quickly adopted it onto their menu, because it was cheaper, more easily accessible. SV: And ironically all the local fish that no one wants to eat in India, gets exported ! GN: Like China, Vietnam, Indonesia, Korea, wahaan pe export ho rahein hai because our local people are not eating it. So fish like tuna, mackerel, ribbon fish, groupers, not groupers sorry horse mackerel, parrot fish ,like this I can name hundreds of fish which should be eaten in India, which should be self sufficient. RV: But leaving sustainability aside, it’s ultimately very important to create a viable business especially for the small scale independent producers many of whom don’t want to do anything else except what they’ve always done and have the skills to continue doing. SV: This is the challenge for people like Arshiya, Ganesh, Sumesh and the communities they work with. And the challenges here range from finding consumers willing to pay an extra buck, to being supported to make changes to their production, to finding ways to not be a victim to the vagaries of the international market, and other aggressive competitors. RV: There is a growing anxiety around climate change. It’s impossible not to feel it. For a long time we’ve consumed without any understanding of what the consequences are. A new book on climate change by David Wallace-Wells talks about how the majority of fossil fuel burning occurred in the last 25 years. And in India this has happened in an even shorter time period. For years India’s position has been about how we have the right to pollute because as a poor country we asserted our right to develop, which meant we could not be held to the same standards as industrialised nations. While our per capita pollution rate may be low, it is highly skewed, because we have a huge urban aspirational middle class, that want things. How do we start putting the breaks? People point to policy, to regulation, to making climate change a political mandate front and centre and this cannot be underestimated. SV: Many also say that ethical consumerism is a drop in the ocean compared to scale of the problem, and that it can only dealt with by political will. While we cannot hide behind the rose tinted goggles of the ethical labels, ethical consumerism is the first step in the pathway towards buying into a more ethical economic system. GN: Do you ask where the fish is coming from? If that amount of money is being given to fisherman, sourced locally and then served onto the plate that economically can be profitable for fishermen. You have to change your eating habits not just focusing on two fish Surmai and Pomfret. You have to focus on other species which are available like tuna mackerel and all these where the value of the fish is right now hundred but within a few years time if that goes up to 200 rs at least that will be economically sustainable for fishermen then he can talk about sustainability then he can talk about putting less effort in fishing because he is getting the money for the other fishes then it can be a successful model. JK: So to come back to your original question, working with the consumers is very important, I don’t belittle that all because that is what i was doing from the very beginning .. from day one of my entry, this is what I was trying to do. I was trying to educate the consumer both in terms of what fish is but more importantly who is catching this fish, I wanted them to know who is catching this fish and why we are doing this, but as I said, of the 20 tonnes of fish that landed in my village every week I was able to do this only for 200 kilograms, okay? Ah, so that almost the kind of proportion that you are talking about of the lot good work that is going around in Bangalore and other big cities trying to say look consume only this fish during this month and don’t eat mackerels at this time and all that. AUB: Yes we have this project that looks at inspiring consumers to think and engage with where their coffee is coming from. Being very well aware of the fact that perhaps increased consumerism is the source of a lot of issues we face. So we know this. And I don’t think there’s any sort of pretence about the fact that consuming less is better across the board. RV: Many small-scale producers around the world are being driven into sustainable production because they think it will add value to their products, but for them to be successful to the point where it makes a really big impact we also need for big enough market - its a scale issue. In India in particular environmental solutions are closely associated with small scale production and the conditions under which they operate. SV: It’s clear that we are all muddling our way through this. AUB: That of course ethical products are too expensive for them to make any impact really in the kind of farming side of things. For me it’s really simple. I’d like to see far more community based solutions to the problems we find. Whether its within our cities or in the farming space or the conservation space. I think we’ve depended on either the donors or the state for far too long and then sort of shelved the fact that we ourselves can create models that don’t rely on any of these. SV: There are questions that need to be asked of every individual and every business and every state. Like are you willing to buy less? Are you willing to buy more ethically? Are you creating a market opportunity that might be there for an ethical brand? Are you willing to see the ecological and social injustice in the current economic system and are you willing to find a way to be a part of the solution? TZ: So my name is Thomas Zacharias and I'm a chef partner at the Bombay Canteen, Yeah, my life revolves around food. JK: Okay well my name is John Kurien. GN: My name is Ganesh Nakhwa, I belong to the Karanja Fishing Cooperative Society. AUB: I’m Arshiya and I’m the founder of Black Baza Coffee. YES! RV: And thank you SUMESH MANGALASSERY who forgot to tell us his name in the six hours plus of audio footage we have of him. Thanks to Thomas Zacharias, Arshiya Bose, Ganesh Nakhwa, John Kurien and Sumesh Mangalaserry.